I hate to sound like a broken record but surf fishing conditions continue to be the big story for anyone trying to fish our local beaches. The steady easterly wind has brought weeds from offshore and blanketed the sand from Hobe Sound to Fort Pierce. The ability to keep your line clear of the weeds as the easterly winds push them towards the shoreline has been almost impossible. I made a couple of stops on Sunday at Walton Rocks and Dollmans Beachside with the hope of catching a few whiting and croaker in the first trough, but the wind was too strong and the ever-present weeds continually loaded up on my line. I tried Middle Cove this morning, as the wind speed was not as strong as the two previous days, but again the weeds proved to be too much. 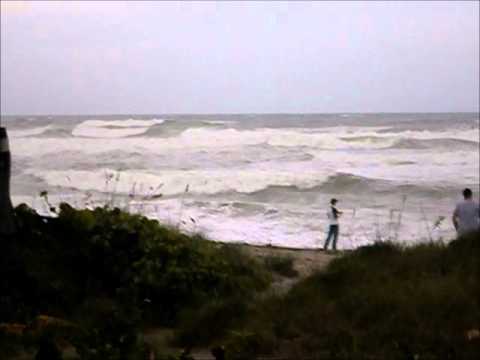 I spoke with a few of my friends that were trying today at Hobe Sound, Tiger Shores, and Virginia Forrest beaches and they all packed it in after a very short stay due to the same conditions that I experienced. Hopefully conditions will improve as the week moves on and as sometimes happens, some beach accesses may hold less weeds than others and will become fishable. Pompano, bluefish, jacks, whiting, croaker, ladyfish, and blue runners should all be in the mix when conditions permit. My advice is to not focus in on one beach but be mobile and try different beaches finding the one with the best conditions. I will be out doing just that and if I find an area that provides good conditions I will definitely post it so you can at least have a good starting point.